This is one of those things that I never thought would be happening. I arranged a one-to-one with Mary Maguire, and during our meeting we got talking about business awards and us recently winning Marketing Derby’s Rising Star award. Mary mentioned that she had been asked to write an article on the topic and asked if it’d be ok to interview me for the article. Fast forward and as I’m browsing through my copy of the Chamber’s “Network” magazine I spotted a very familiar face! 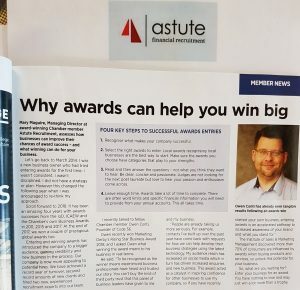 Keeping on track with the article, I think this is a great example of how business awards can be incredibly powerful for increasing a brand. Bake Sale – £10 Challenge from MS Society Derby Marketing Derby Welcome Pack Arrives!